Ten large-scale congresses will draw a combined total of around 77,000 international participants to Vienna's Austria Center between March and November this year. Eight of these events will focus on medical specialisms. The European Congress of Radiology (ECR) will kick off the conference season in early March, with 20,000 radiologists in attendance, followed shortly afterwards by the Congress of the European Association of Hospital Pharmacists (EAHP). The European Geosciences Union (EGU) General Assembly, will see 14,000 experts converge on the Austrian capital in April, while around 8,000 kidney specialists are expected to attend the European Renal Association – European Dialysis and Transplantation Association (ERA-EDTA) Congress in May. Sport will take pride of place in July, as the venue hosts the Annual Congress of the European College of Sport Science (ECSS). Events scheduled for autumn include the European College of Neuropsychopharmacology (ECNP) Congress in mid-September and United European Gastroenterology (UEG) Week in October. "I’m very pleased that our efforts over the past few years – not only the redesign of the venue, in particular the new furniture, the Business Lounge and the new lighting concept in Hall A, but also the dedication of our sales team and project managers when it comes to staging conferences – are now clearly bearing fruit," said Susanne Baumann-Söllner, managing director of the Center. 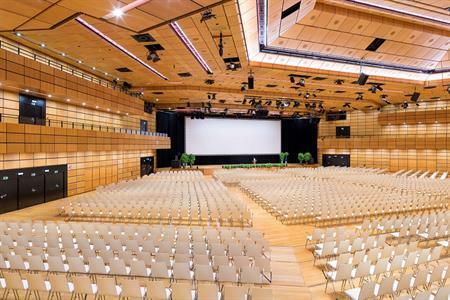 "Especially in the last three years we have shown just how effective the Austria Centre Vienna is at staging successful international congresses," she added.